Nintendo has announced that as of the end of June it will no longer be accepting stage designs and other user-created content for Super Smash Bros. Brawl. 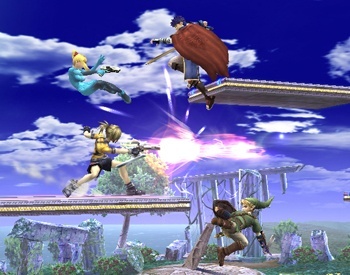 Super Smash Bros. Brawl allows players to create their own "stages" and then distribute them to friends or upload them to Nintendo through Nintendo Wi-Fi Connection, along with in-fight snapshots and replays. But a brief message posted on the Smash Bros. Dojo says the service will be coming to a halt at the end of this month. "As of June 30th, 2009, the current service that accepts user-generated snapshots, stage designs, and replay data will no longer be available," it says. "Please note, however, that we will continue to distribute such data after that date." Infendo has reported on speculation that SSBB players were uploading hacked stages that "borked the system" but Nintendo has not offered any explanation for why the service is ending, nor whether or not the "current service" might at some point be replaced with a "new service."